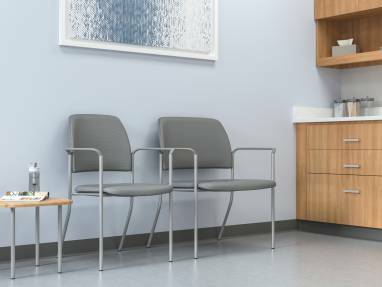 Exam rooms today require a new type of experience — one that builds on doctor-patient-family member collaboration. 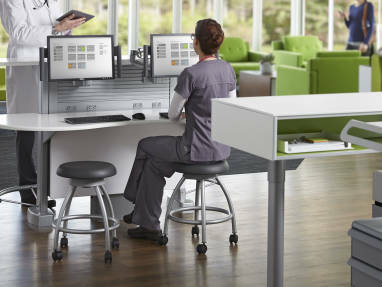 Steelcase Health researchers identify key needs that must be met and new design principles to support them. The Multi-Purpose Exam room creates a relaxing environment that supports learning. Retail Healthcare Exam Spaces are a one-stop shop for patients. These spaces are typically located in or near a pharmacy. Node with ShareSurface can be used for information exchange with patients and moved aside to perform a physical exam, improving the experience for clinicians, patients and their family. Corporate wellness spaces reduce time away from the office and support an organization’s commitment to employee wellness. 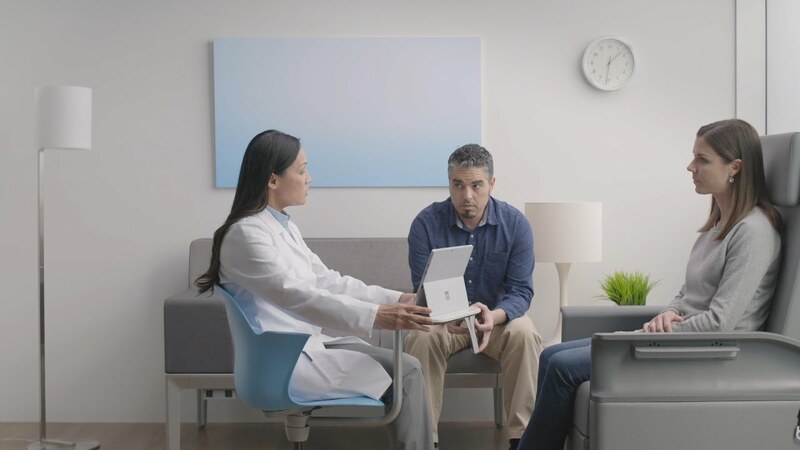 Designed to remove barriers between patients and clinicians, Node with ShareSurface nurtures human connection, essential for consultative care. And when patients participate in developing the action plan and understand it, they tend to be more engaged in their care. Because patients all have different learning styles and literacy and acuity levels, effective exam rooms leverage multiple ways of presenting information. Increasingly, shared learning may include viewing digital information from the patient’s as well as the care team’s mobile devices. 1 Ahren, D., Woods, S., Lightowler, M., Finley, S., & Houston, T. (2011). Promise of and potential for patient-facing technologies to enable meaningful use. American Journal of Preventative Medicine, 40(5, Supplement 2), S162-S172. Family or other support persons in the exam room are important partners in the patient’s health.4 Accommodating their presence—whether it’s physical or virtual via videoconferencing—helps ensure that important information is shared, understood and factored into decisions about care. 4 Frampton, S., Wahl, C., & Cappiello, G. (2010). Putting patients first—partnering with patients’ families. American Journal of Nursing, 110(7), 53-56. Efficient, well-equipped spaces that simultaneously support the patient and family interaction with care team members can support efforts to improve patient satisfaction and ease staff burnout. 3 Bodenheimer, T., & Sinsky, C. (2014). From triple to quadruple air: Care of the patient requires care of the provider. Annals of Family Medicine, 12(6), 573-576. To be effective versus intrusive, technology must be seamlessly incorporated and carefully managed in exam rooms.5 Mobile devices, apps and web-based information are new tools for diagnosis and treatment, accessing and sharing information, and communicating effectively. However, if exam rooms aren’t well-designed for technology use, it can be more harmful than helpful, detracting from conversations and distancing participants from each other.6 In contrast, when everyone can easily and equally view and share digital information, it has the potential to boost collaboration and shared decision-making. 5 Almquist, J., Kelly, C., Bromberg, J., Bryant, S., Christianson, T., & Montori, V. (2009). Consultation room design and the clinical encounter: The space and interaction randomized trial. Healthcare Environments Research and Design Journal, 3(1), 41-78. 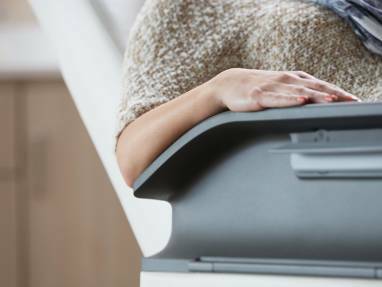 Wherever appropriate, replace exam tables with recliners so that patients and care team members can be eye-to-eye, enhancing communication. Provide adequate space and comfortable seating so that family members can feel welcomed and be included in the exam. 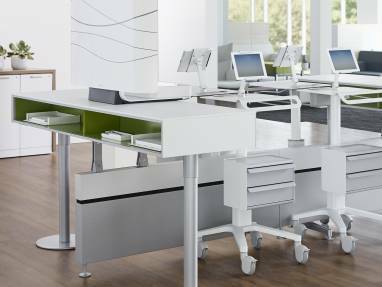 Create a collaboration zone with same-level seating and equal access to digital and analog information. 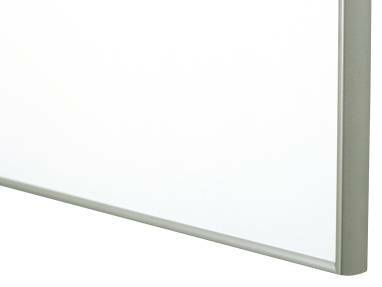 Provide compact surfaces for patient and family members’ notepads and pens, mobile technologies, and/or personal items. Support videoconferencing with specialists or family members who can’t be physically present. Include a work setting for scribes and other participants in the healthcare team. Zone the exam area so clinicians can easily arrange and use their equipment and tools. Choose storage that minimizes visual clutter while keeping frequently used items in easy reach. Leverage vertical planes for information displays and technology hosting. Place handwashing opportunities in direct visual relationship with the exam room entrance(s). 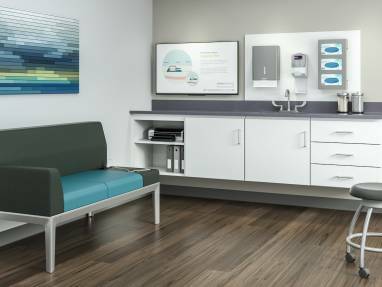 Select surfaces and furnishings that can be quickly and easily cleaned between patients. 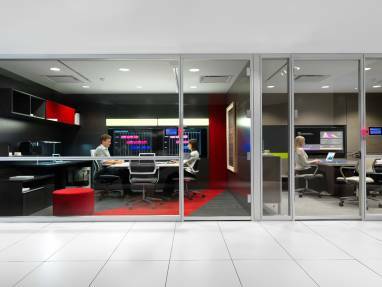 Build in flexibility with demountable walls and modular furniture to support evolving technology. Provide For Participants’ Emotional Needs + Comfort. Include storage for patients’ clothing and personal items. Ease transition times with positive distractions by providing monitors for viewing. Provide visible access to basic hospitality items for patients and family members: power, tissues, etc. 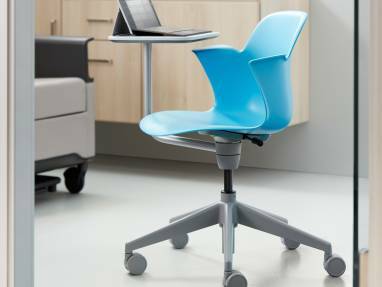 Select mobile seating for the care team so they can fluidly move close to patients and family for meaningful conversations. Preserve information privacy with acoustic integrity. Healthcare is experiencing rapid change that can often feel overwhelming. 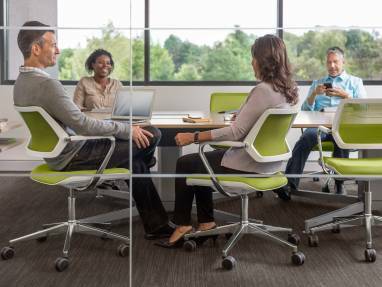 At Steelcase Health, we look for the changes that are possible. We study the places that support health and then deliver insights, applications and solutions designed to create moments that can lead to change. Moments that enhance the wellbeing, empathy and connection of clinicians, patients and families.